For a simple overview of installation, see our Software page. You may also find Amazon's Getting Started Guide useful. If you don’t have an EC2 Account, you can create one for free -- Amazon offers a year's worth of free time for new users; and offers grants for research and education. 7. Enter "DistrictBuilder" in the blank, and press the "Return" key and you will be presented with a list of available AMIs. OR if you are logged into AWS, you may click on one of the following links to initiate the launching of an AMI for the state of your choice. We are working on preparing data for for states. Also note that our partners may may be administering instances of our software open to the public. We list our partners on the right hand sidebar of our home page. 8. Click on the “Select” button (if you have not clicked one of the above links). While there are several options on this screen, you typically only need to select the instance type. This is an very important step that you need to pay attention to! Amazon charges are related to your instance size. We recommend large or extra-large, but small geographies (e.g. Rhode Island) can also be run on a micro instance -- which literally costs pennies a day to run. Also note that you can turn on and off your instances using the EC2 management screen. We highly recommend turning off your instance when it is not in use, as Amazon charges by the hour. Then click on the “continue” button at the bottom of the screen. 10. You are then presented with the "Advanced Instances Options" screen. No action is needed here for typical installations. Click the “Continue” button. 11. You are then presented with the "Add Tags" screen. No action is needed here for typical installations. Click the “Continue” button. 12. You are next presented with the key pairs screen. Choose "Create a new Key Pair" for typical installations. Give your key pair and name and click “Create & Download your Key Pair”. You will be prompted to download your key pair file. 10. You are next presented with the Security Groups screen. The default Security Group does not have the proper configuration for our software, so you will need to "Create a new Security Group" with the customized settings. 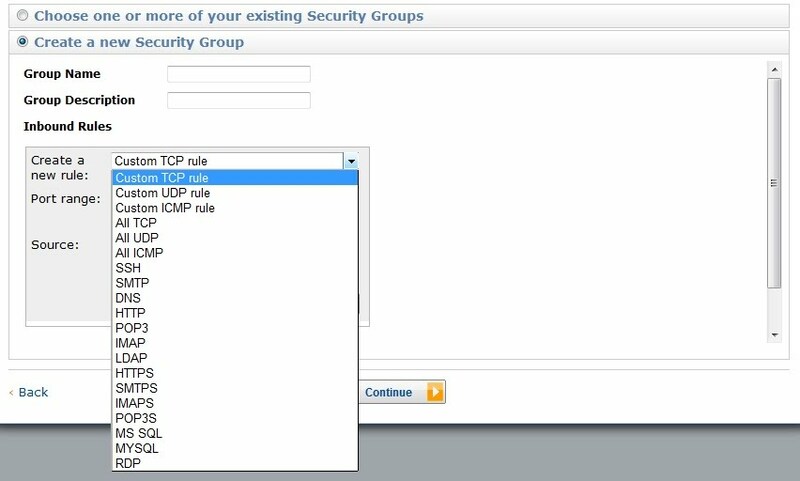 Give your new Security Group a name and description. Anything will do, but descriptive text is recommended. The "Create a new rule" pull-down menu reveals a list of rules. 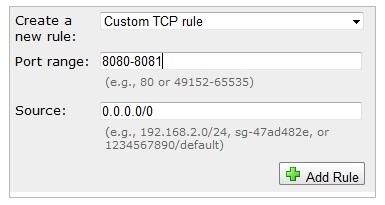 You will need to create rules for SSH, SMTP, HTTP, HTTPS, and SMTPS. When you select each of these, simply accept the default settings by clicking the "Add Rule" button that will appear. Once you have created these rules, click the “Continue” button. 11. You are next presented with a review screen of your settings. Click "Launch" to continue. 12. Your AMI is now listed on the among your “Instances” in the EC2 navigation menu. 16. Click "sign up", create a user account and test it out. Note: this creates an account on your instance only. It does not share e-mail or other account information with our server or any other instance. 17. You can also login to customize the look and feel of instance or to change its behavior in other ways. See the documentation for AMI installation.